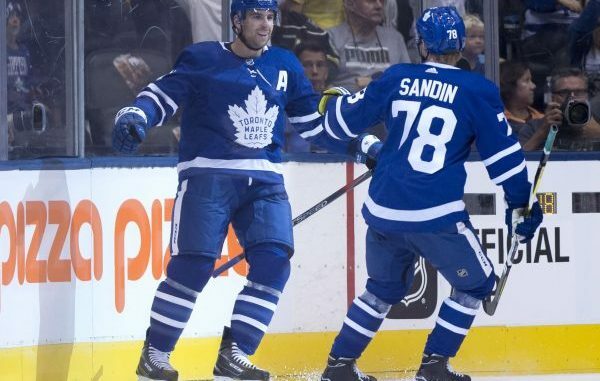 – Nazem Kadri put the Maple Leafs on the board with a goal at 11:48 of the first period and later registered the primary assist on Patrick Marleau’s second period goal. Of Kadri’s 28 points this season, 21 have been primary points (10 goals, 11 assists). Tonight’s game is his seventh multi-point game of the season. – Patrick Marleau had the secondary assist on Kadri’s first period goal before scoring Toronto’s second goal of the night at 13:06 of the second period. Tonight’s game is Marleau’s second multi-point game of the season. Thirteen (7-6-13) of his 22 points have come against Eastern Conference opponents. – Mitch Marner scored the third Maple Leafs goal of the game at 14:49 of the second period. Marner has goals (4) and points (4-1-5) in four consecutive games. He has 17 points (7 goals, 10 assists) in 14 games against Atlantic Division opponents. – Zach Hyman scored Toronto’s fourth goal of the night into an empty net at 19:09 of the third period. Hyman has five points (3 goals, 2 assists) in 11 games against Atlantic Division opponents. – Kasperi Kapanen registered the primary assist on Kadri’s first period goal. Kapanen has two points (1-1-2) in two games against the Lightning this season. He has points (1-3-4) in three consecutive games. – Nikita Zaitsev picked up the secondary assist on Marleau’s second period goal and later registered the primary assist on Hyman’s empty net goal in the third period. All five of Zaitsev’s assists have come on the road this season. Tonight’s game is Zaitsev’s first multi-assist and multi-point game of the season. – John Tavares recorded the primary assist on Marner’s second period goal before adding the secondary assist on Hyman’s empty net goal in the third period. Tavares has 30 points (18 goals, 12 assists) in 22 road games this season. He has registered 16 points (7 goals, 9 assists) in 14 games against Atlantic Division opponents. – Andreas Johnsson notched the secondary assist on Marner’s second period goal. Johnsson has assists (2) in two consecutive games and points (1-2-3) in three consecutive games. – Frederik Andersen stopped 36 shots to earn the victory tonight. – The Maple Leafs are 16-5-1 on the road this season. – Toronto’s all-time record is 54-32-2-7 in 95 games against the Lightning and 26-17-1-4 in 48 games played in Tampa Bay. – Toronto is 17-9-2 against the Eastern Conference this season and 7-5-2 against the Atlantic Division. – The Maple Leafs were 3-for-4 on the penalty kill and 0-for-2 on the power play tonight. Toronto is 10-7-0 when allowing one power play goal this season and 16-10-2 when not scoring a power play goal. – Toronto is 7-12-1 when their opponent scores the first goal of the game. – The Maple Leafs are 5-6-0 when tied after one period and 22-0-0 when leading after two periods. – Toronto is 16-5-2 when outshot by their opponent. – The Maple Leafs are 5-4-1 in Thursday games. – Toronto has won four consecutive road games. – The Maple Leafs won 63 percent (5 won, 3 lost) of their faceoffs on the penalty kill. – Jake Gardiner was on the ice for a team-high in Toronto shot attempts-for at 5-on-5 (23). Gardiner had a team-high 5-on-5 shot attempt percentage of 60.5 percent (23 for, 15 against). – Frederik Gauthier and Par Lindholm were the lone Maple Leafs to not start a 5-on-5 shift in the offensive zone tonight. I thought we had a good effort tonight. I thought we had everybody on board. I thought Fred [Andersen] was real good in the third, obviously, down the stretch. I thought our team played well. We could have had a lot more, I thought their goaltender was good too. It was a good game for our team. We haven’t been as sharp as you know here lately and, so, I thought this was a good response. We talked a lot about it and getting back on track, working hard and doing things right. I thought we did that. Yeah, for sure. It was a very competitive game. There wasn’t a whole lot of room for either team, especially through two periods. I thought our guys really dug in and worked hard and competed hard. That’s a great question. Patty [Marleau] hadn’t been on the board in a while and Naz obviously wasn’t as good the other night. Was it just Kapanen being with them? I don’t know, but they had a good night for us and set the tone for us and got us going. I thought the first one, it’s a bounce, it comes right to where you’re looking to get hit. It didn’t happen. They probably had some better looks later and it didn’t go in. They’re a good team, we didn’t want to be in the box at all and they were pretty disciplined. It was good killing by our guys and obviously Freddie was good. I’m really happy with the way we responded. I think everyone’s a little embarrassed of the effort we put in last game and I thought we came out and worked hard at eliminating their time and space. I think that helped us with tracking really well and we turned some pucks over, especially when we had the lead in the third. Hopefully we can put a few together now. I think we showed that we’re a pretty good hockey team when we work this hard. It’s what we expect of each other and hopefully we can put the other games behind us and keep going. Yeah, it shows a lot about our group. I think, especially giving up that early goal, it could have been easy for us to let it slide but we were able to respond with a couple of good shifts and just stayed in the game. I think up and down the lineup we were pretty solid tonight and that’s what we needed to win. I think all of the good teams do that. I think we embrace the challenge of playing against the best. I think we’ve proved time and time again, even though there are tough parts to the season, that we can compete with the best so I think that’s an important note to take out of this game and hopefully this kickstarts a nice run for us. I think just what we talked about this morning. Making sure we were above guys. Making sure we were giving their players no space and time throughout their zone and the neutral zone. I thought we did a good job of that. In the third, we didn’t sit back either, we kept going. That’s something that we’ve got better at over the past years. I think it just shows how hard we have to work and how we have to play to win games, especially down the stretch. It starts tonight. That was a big game for us. This is a great team. We knew coming into it, we knew it wasn’t going to be an easy game. Like I said, from this morning we knew what we had to do to beat them. I thought we did everything we could and came out with two points.